I arrived at check-in and headed for the 'Royal First' queue, and I was checked in immediately. My bags were tagged with Royal First tags through to Tokyo Haneda and boarding passes printed for both this sector and the next one to Tokyo. I had pre-selected seat 2A when I booked the flight, this is my preferred seat on the 747. The seats in row 1 are a little too close together which is good for a couple but if flying solo row 2 is preferred. Having tracked the incoming flight from Bangkok I was already aware that the flight today would be on HS-TGO, a 23 year old Boeing 747-400 which unfortunately had the older first class product, and not the newly installed suites. As of December 2014 Thai operate 12 Boeing 747-400's, 6 of them in older configuration (used a lot on Asian routes and the non-premium Europe routes like Milan) and the other 6 in suites (used on longer haul premium Europe routes). For Sydney with the current schedule it is a mix of both old and new product in First Class. The business and economy product is essentially the same on all of the jumbos. So, whilst I was a little disappointed, it wasn't the end of the world. In fact it was only a year or two ago where this was the best product that everyone was hoping to get! Having been given express passes for security and passport control it was only a few minutes before I was navigating through the duty free shops and onwards to the Singapore Airlines first class lounge. Thai usually use the Air New Zealand lounge but at the time of my flight it was closed for renovations. Regardless, any Star Alliance first class passenger is entitled to use the Singapore First class lounge.... even if the lounge attendants may try and point you towards NZ. The lounge attendants took a look at my boarding pass and opened the 'secret entrance' to the First Class lounge, which is a special sliding door to the right of the reception desk. Once inside I was welcomed by one of the lounge staff who offered me some cooked to order breakfast. I declined as I was not hungry and instead ordered a coffee which was brought to my seat by the window. 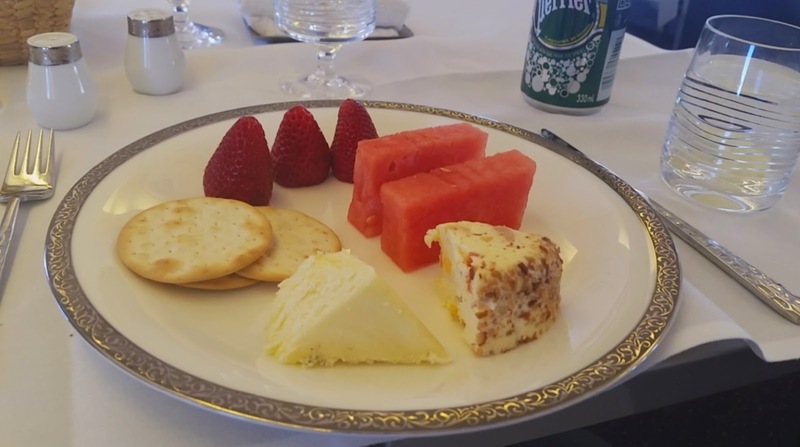 The friendly staff member advised me the buffet was being cleared as it was time to start changing over from the breakfast menu and since the Singapore Airlines flight had just left there would not be any food for a while. This didn't bother me at all as I wasn't hungry and just wanted to relax. At about 9.20am I decided to wander over to the gate area and see if boarding was ready. Singapore Airlines do not make boarding announcements in their lounge for any flights other than their own so it is up to you to make your way there. This is the opposite to what Qantas do in their first class lounge, with all oneworld airline boarding calls being announced. I don't see what is so hard about making a boarding call for Thai Airways considering the airlines are supposed to be partners and this is the only first class facility for star alliance in Sydney. Despite it being past the advertised boarding time the gate was still crowded with people waiting for boarding to commence. Eventually at about 9.30am the wheelchair passengers were escorted onboard, shortly after priority boarding was called. I got my boarding pass scanned and eagerly headed down the jetway, the Dom Perignon was only moments away! The fairly senior female crew member serving me seemed very relaxed and friendly. I could tell she was going to provide a good service on board. She offered to take my photo with my phone so I could show off on facebook and instagram, which I did of course. It's always nice to show off when flying First Class right? Well maybe not, some people might get a bit jealous. I was pleased to see the Rimowa hard case amenity kit was already provided next to the seat. Today's colour was dark brown. I was also offered a pair of pyjamas in a powder blue colour. I would make use of those later on when I needed a nap. Soon enough boarding was complete, just 5 First Class passengers today out of 10 seats. At 2 minutes past 10am, we pushed back from the gate and the 4 General Electric CF6 engines sprung to life. The takeoff was towards the north on runway 34L, and the views were great from the nose section, with so many windows available! Soon after takeoff I popped out the IFE screen which comes out of the side of the seat. By today's standards it is rather small! However at least it is on demand and there is a decent selection of movies and TV shows. I noticed the movies were till from October even though we were well into November. Thai have still not improved on loading the new entertainment at the turn of the month, they have been slow on this for years. Thai Airways if you are reading this - make an effort to get the new entertainment loaded by the 1st of the month or thereabouts please. The table was then set up, Thai have recently updated their serving ware for long haul business and first class, now featuring a silver trimmed circular plate. Caviar.... it's fancy and all, but I don't understand the fascination with it. I mean, its ok but is it really that amazing that it's worth the price its sold at? I think Thai continue to offer it because they know their overall product is a little below the likes of Emirates,Cathay and Singapore Airlines, so they try to compensate by continuing with the old tradition of caviar. I'm sure there are plenty of big fans of it but I could take it or leave it. Despite the fact that I enjoyed this starter, I do think Thai need to offer a choice of at least 2 options. Not everybody likes seafood, or duck liver terrine. In first class the customer should be able to create a menu that is perfectly suited to them. With no choice of dessert or starter Thai loses points. On Emirates, Qantas, and most other first rate carriers there is a choice of 2 to 3 starters at least. As you can see Thai use this centre storage area as a bar. You can help yourself if you wish. The Dom Perignon is in the ice bucket closest to the camera. Passenger in 2K has chosen to close his blinds already, but for me I like to watch the passing changing landscape as we head into the 'red centre' of Australia. Yes, there is still more food to come. There is no way you will go hungry on Thai. The dessert was a chocolate mousse cake and I ordered a peppermint tea to go along with it. A nice hot towel was also provided to freshen up (probably the 4th hot towel on the flight so far). The chocolate mousse cake was ok, not too fancy and probably pretty cheap really. But it was fine. I don't think I managed to finish it, as I was simply too full. Considering I had been up all night working and had no sleep I was extremely tired at this point. I asked the crew to set up my bed and then I went and got into my pyjamas for a 4 hour nap. A mattress is placed on the seat to smooth it out, and it's quite comfortable really, the only drawback being the lack of privacy when compared to the more modern 'suite' concept in first class. I dozed off pretty quickly and woke up with about 2.5 hours to go before arrival in Bangkok. I watched some TV shows on the entertainment system for a while and decided to go for a walk around the aircraft. It seems the flight was not that full, so there was a fair bit of space for the economy passengers to spread out up the back. I had the dumplings for my main course, just 4 of them on a plate. Taste was ok, perhaps a bit dry. I suppose they can't steam them properly on a plane. And finally, the Chocolate Tart to finish. That was pretty nice, but basic and probably no different to what was being served in business class. At least the Dom Perignon was still free flowing. I was the only one drinking it. Here we have seat 1K which was vacant on this sector. It's a good seat although a little close to seat 1A. For couples flying in this cabin 1A and 1K is recommended. Well that pretty much was the end of the flight, only a short time before descent commenced into Bangkok. I did spend about 10 minutes in the side galley chatting with the crew who were all very friendly. We took a few photos together and talked about the Jumbo Jet. The flight attendants seem to love it, in fact the one I spoke to said she only ever works on Boeing 747 flights, has never been near an A380. Quite interesting. We touched down on a very wet runway 01R. A shower must have passed just prior to our landing. From this runway it was a very short taxi to gate C10, the most distant gate you could get from immigration. Fortunately a perk of First Class is being driven from the gate to either the lounge or immigration on a buggy. The gate agent took us to the VIP fast lanes for immigration and even managed to get us ahead of the people waiting in that queue! Nice service indeed. As I did not need to pick up my bags I bid farewell to the agent and headed into Bangkok to waste some time during the 8 hour transit. Overall one of the best flights I've been on with Thai. The cabin crew really stood out on this sector, very warm and friendly at all times. And I did not feel rushed with my meal service, which has been a problem for me on previous sectors. Next up in part 3 is the red eye first class sector to Tokyo Haneda, stay tuned! Very well articulated and informative blog. An entertaining read! Loved your trip report. I'll be taking this same trip in November. Thank you so much for the information. Thank you for sharing your Thai Airways First Class experience. I am eagerly looking forward to TG476 in September then onto Rome via Munich. I would love to be on the newer configured version however I found your critique reassuring.